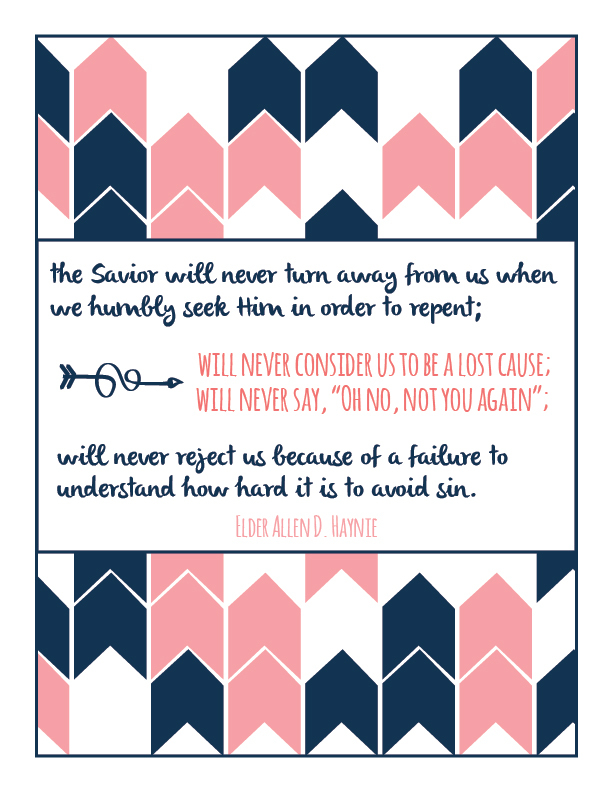 This month in Young Women's and Youth Sunday School, we are learning about the Atonement. I love that we get to teach and learn about our Savior's Atonement during the month of Easter. A recent experience taught me a little more about the importance of daily repentance. My Young Woman age daughter was in a car accident. She was turning left at a yellow light and thought she had enough time to make it, when a truck hit her. A split-second decision to turn has left her with very lasting consequences. She luckily wasn't hurt badly - just some mild whiplash. But her poor car that she has had for only 6 months, is now totaled. The freedom that she has enjoyed of being able to drive herself around is no longer a reality for her. She now has to continue to pay off a car that she can't even drive. Going to work has become a drag for her, knowing that the money is going to a loan for a wrecked car. On our way home after the car accident, I was thinking about how that one split-second decision has now changed her whole life. It was a good teaching moment with her (and thankfully I was prepared after having studied the Young Women lessons for March!) We started talking about other split-second decisions that can have lasting consequences: taking it too far with a boy, having a drink of alcohol at a party because of peer pressure, watching that rated "R" movie because you're too scared to say no, letting a bad word fly out of your mouth in a moment of anger. The list could go on! Some of these decisions have mild consequences and some could have life-changing consequences! It is so important to teach our youth to make those decisions before they get in a situation. To know that because of the Atonement, we can repent of the little things as well as the big things. Our Savior will never get sick of us or tell us that we've used up our "allotted" repentance for this lifetime. Because there is no "allotted" repentance! We need to try to do better each day and be the best that we can be, and then through our Savior's grace and the gift of repentance that He has given us, we can return to Him someday and be together with our families forever. Even though a split-second decision can have very lasting consequences, we can be forgiven for our mistakes and never be turned away by our Savior!